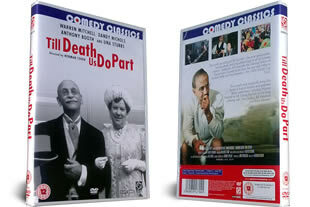 Till Death Do Us Part DVD. The classic film of the world according to Alf Garnet! DELIVERED FREE IN THE UK when you spend over £15. Alf Garnet is the most opinionated, loud and prejudiced bigot in all of comedy. This superb film goes well with the follow on tv series In Sickness and in Health. This film cronicles the history of the amusing Garnett family from the war with Hilter to another battle with the Germans, the 1966 wolrd cup finals. Classic comedy at its best. 1 DVD delivered to your door.